Whedon has filmed this classic comedic tale in black and white and in present day, all the while using Shakespeare’s original language, similar to Baz Luhrmann’s ‘Romeo+Juliet‘, only this time around, everything is not as intense. It was great to see these historic characters live in the present with mobile technology, fancy cars, and fun parties as we see this account of engineered love come to fruition in a light-hearted and comedic light. It was a great experience. Alexis Denisof plays the fumbling and charming bachelor Benedick, who is told by his friends that Beatrice (Amy Acker), his friend in which they spend a lot of time ribbing each other, actually is deeply in love with him. The same is told to Beatrice separately, to which both characters spy on one another in hopes to hear the other confessing their love. This is all done in a slap-stick manner and works on every level as we see both characters provide a bit of physical comedy in their quests. On the hand we have Claudio (Fran Kranz), who is trying to impress the love of his life, Hero (Jillian Morgese), to which a few funny moments come about as well. Meanwhile, the evil Don John (Sean Maher), who is a great villain and has plans to sabotage both relationships to his own enjoyment. He’s not the smartest man, but is very self aware of what’s happening around him and Maher pulls of this character perfectly. Some of the biggest crowd reactions will come with Nathan Fillion’s constable Dogberry and his idiotic deputies who make mistakes and provide a treasure trove of physical comedy every time they are on screen. And of course seeing Clark Gregg coming down from his Agent Coulson role to the fun part of Leonato is not something to be missed, as we see him get drunk and dance the night away. Whedon himself is a master with the camera and is actually one of his best shot films. The angles and creative shots he used all seem to make sense to the story at hand and were used for a precise purpose. It was a magical experience and would definitely love to see Whedon tackle other Shakespeare works. For someone who just made a $1 billion dollar epic super-hero film then follow it up with this black and white artsy movie based on one of Shakespeare’s most beloved creations, shows just how much range Whedon has and how successful he is as a storyteller and filmmaker. 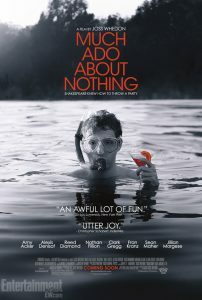 Not only will this version of ‘Much Ado About Nothing‘ make you laugh and have a highly entertaining time, but it is also very true to the original works. With amazing acting, a killer cast, and stellar direction, this little gem of a film is thoroughly recommended. This entry was posted on Thursday, June 6th, 2013 at 2:23 pm	and is filed under Film, News. You can follow any responses to this entry through the RSS 2.0 feed. You can skip to the end and leave a response. Pinging is currently not allowed. « ‘Expendables 3’ Is Coming to a Theater Near You!! !